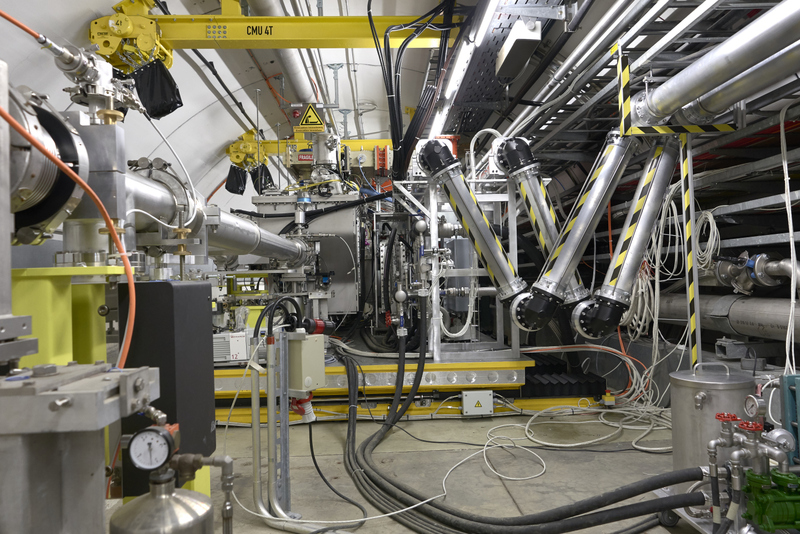 The High-Luminosity LHC (HL-LHC) project aims at increasing the number of collisions in the LHC and consequently improving the precision of the experiments’ analyses. For several years, engineers, technicians and operators have been devising, designing and building the components, some of which are completely novel. Among these innovative components are the “crab cavities”, which will rotate bunches of the beams to increase the overlap between them and therefore the probability of collisions inside the experiments. I have coordinated the recent installation of the cryomodule containing the first two prototype cavities in the Super Proton Synchrotron (SPS), where they will be tested this year. Here’s the story so far in pictures. (Images from Julien Ordan and Maximilien Brice/CERN). 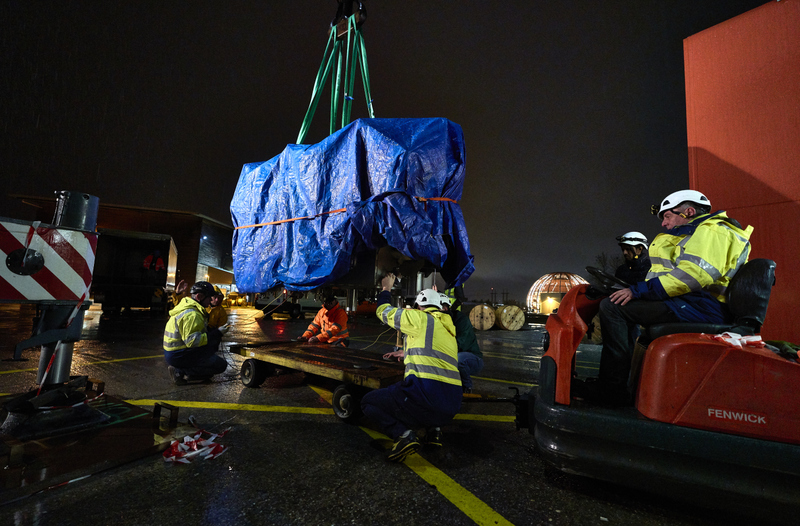 A January morning at 6 a.m., in heavy rain, all eyes are on the delicate operation of moving the cryomodule containing the first two crab-cavity prototypes from the SM18 hall to the SPS tunnel. The prototypes must be tested with a proton beam to validate their design and operation. After a descent of 40 metres, the cryomodules are now in the SPS tunnel. Only another 40 metres or so to go to reach the test station. The movement of the cryomodule is monitored continuously by sensors: it must not be tilted by more than 10 degrees and acceleration must stay below 0.3 g. At the final location, a delicate lifting operation is undertaken: the cryomodule is taken up by high precision positioning jacks. The cryomodule must be tested with a proton beam under real-life conditions, but without interfering with the operation of the SPS. It is therefore installed on a mobile transfer table, designed and fabricated by AVS Spain, allowing the crab cavities to be inserted into or removed from the beam line with almost micron-level precision. 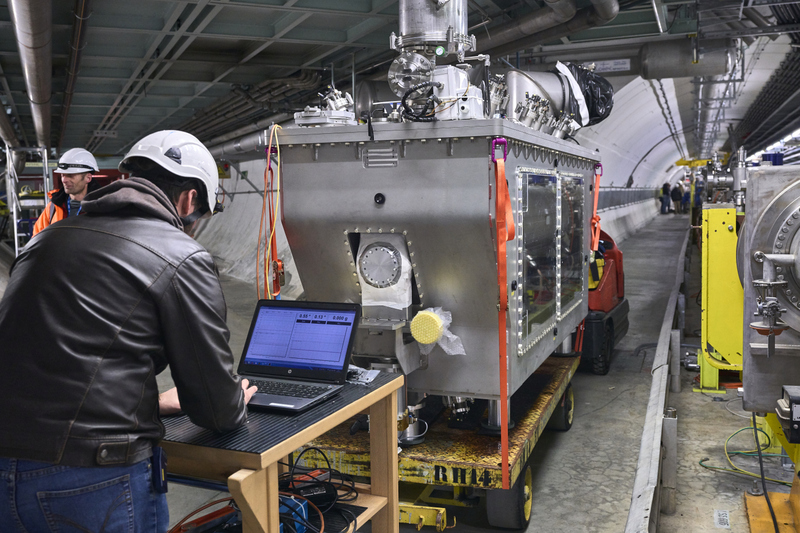 CERN’s cryogenics team had to develop a mobile cooling unit – a first. 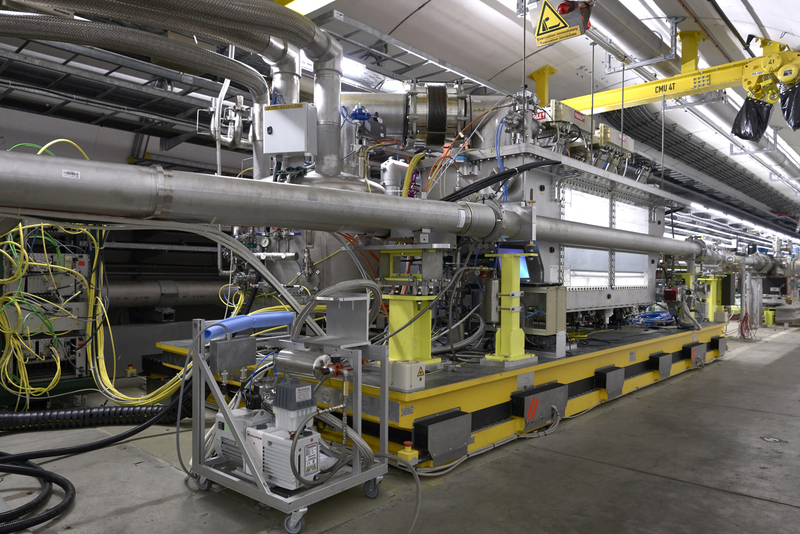 Unlike the LHC, the SPS does not have a cryogenic infrastructure, but the crab cavities are superconductors and must therefore be cooled to 2 kelvin (-271 °C). 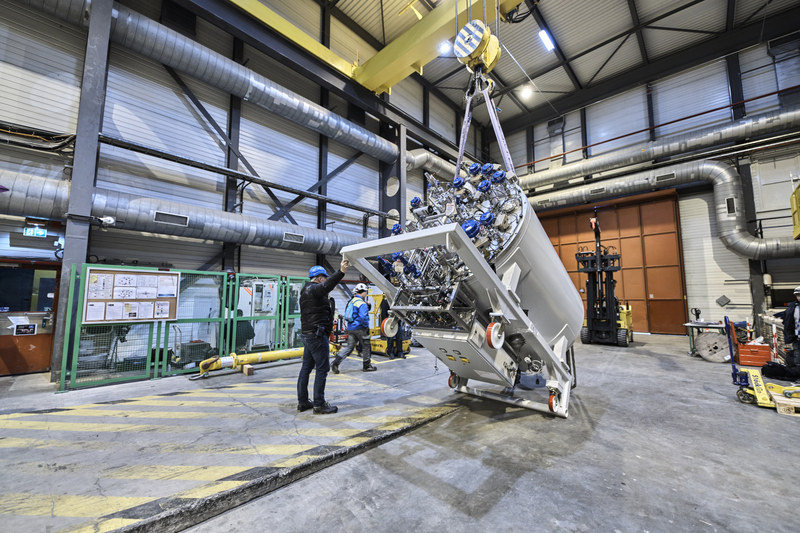 The last phase of the installation is the positioning of the cryomodule, which was first successfully tested above ground. 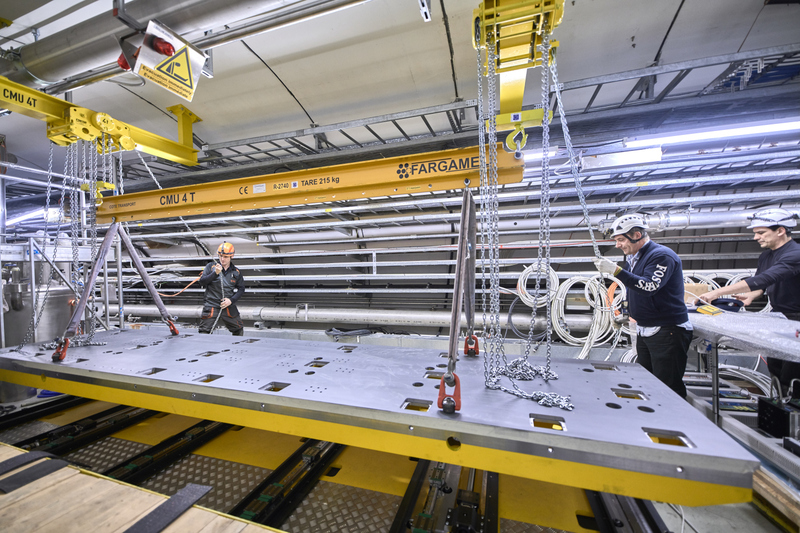 In order to follow the movements of the transfer table, all of the services connected to the cryomodule must be articulated or flexible. This includes the radiofrequency power transfer lines and the vacuum chambers that connect the cryomodule to the SPS beam line. The vacuum chambers are articulated with bellows, allowing the cryomodule to be positioned in or out of the beam line without affecting the quality of the vacuum. Quite a feat of engineering. Finally, three flexible cryogenic lines transport coolant liquid and gas. Only once all of these flexible components are connected can the movement of the transfer table be tested. The teams work relentlessly to resolve the problem. And finally... the cryomodule is ready for beam. SPS has now restarted and tests will take place this year. Giovanna Vandoni tells us more about the High-Luminosity Large Hadron Collider (HL-LHC) project and the role of crab cavities. For more information on crab cavities, read this CERN Courier article.